To ensure utilities and consumers win in the modernization of power grids across the globe, everyone in the ecosystem needs to consider all the moving parts involved. An open-infrastructure approach will rapidly lead to innovation and achievements, while limited, closed approaches will ultimately kill innovation and benefit very few. We hope this article will assist all leaders making major smart grid decisions that will serve many generations. The critical issue in defining “smart metering” is that it’s not just about the meter. It is really about enabling the smart grid -- an energy infrastructure that runs from generation to distribution and includes thousands of grid-connected devices and systems that consume energy.Smart metering sets the stage for a smart grid “system” offering increased functionality via built-in two-way communications and smart grid applications, many of which provide improved and expanded customer service. Thinking “beyond the meter” and toward an overall system solution delivers dramatic improvements in utility operations, reliability, and customer-service capabilities by offering detailed usage information, demand metering, detailed power-quality data, speedy outage information and flexible billing options. Smart metering systems serve as the key information-gathering source and foundation for a smart grid that helps utilities better manage their operations. The smart grid also helps customers better manage their energy use, of course. Utilities need to ensure a high level of reliability and service to their customers, and this will become more challenging in the near future because of the additions of renewable energy sources, electric vehicles and distributed generation. Smart metering and the rest of the smart grid will make it possible for Distribution System Operators (DSO) to more effectively and efficiently manage the distribution network. Consumers, distribution companies and retailers all benefit from smart grid development. A smart grid can improve management of the transmission and distribution assets, as well as their generation portfolio, in order to keep pace with their customers’ increasing electricity usage and peak demand. For the supplier and retailer, it makes possible and accelerates the adoption of new services to help them differentiate their offerings in increasingly competitive energy markets. All of these vast benefits to utilities also mean, of course, that the consumer wins. The many benefits associated with the smart grid should be viewed collectively. Think of them as an aggregate of benefits to all parties. It is very difficult to build a compelling business case around just one set of benefits to a specific stakeholder. Of course, the consumer, and society in general, will benefit from the smart grid in part because it provides a means to energy conservation – by raising consumer awareness of the cost and impact of electric devices in our homes and offices. The most obvious direct benefit to consumers will be in the form of lower energy bills. The true smart grid creates an energy network that will detect and address emerging problems in the system before they negatively affect service. It will be able to respond to local and system-wide inputs, provide much more information about broader system problems and, most importantly, be able to immediately react to or resolve problems that do occur. Figure 1 illustrates the basic smart grid architecture when implemented as an energy control network. Figure 1. 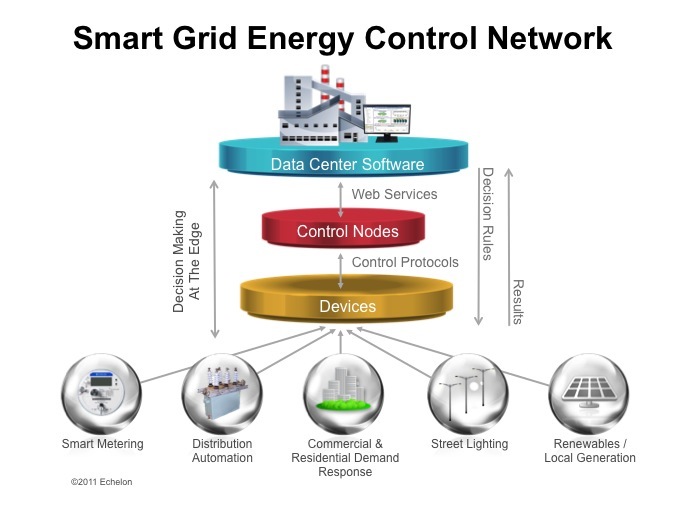 Smart Grid Energy Control Network – Smart devices and networks of smart devices, cooperating with control nodes for autonomous action, informed by rules provided by enterprise applications. For example, demand response (DR) is becoming instrumental in managing the growing demand for energy, especially where it is combined with new and innovative pricing plans and consumer energy use portals. The combination of heightened awareness, an ability to track and manage energy use and financial incentives will give consumers a sense of “energy empowerment” that they have never before experienced. This requires smart metering and smart grid systems that offer distributed local intelligence at the neighbourhood transformer to effectively manage the edge of the grid -- where decentralized generation, electrical vehicles and customers must constructively co-exist. In order to support the various networks and interfaces within the smart grid now and into the future, one of the most important and basic requirements is an open architecture. This is to support not only today’s services and applications but also the provision of new services and meeting new market demands without replacing the core infrastructure and associated equipment. Interoperability is too often used as an excuse to push a particular technology, regardless of its actual suitability for the application. Such agendas manifest themselves as a “choose one standard” technology approach. Technologies will continue to evolve. Instead of requiring a single standard, utilities need a smart grid system with an open infrastructure, one that many companies have adopted and upon which they have built custom solutions. These solutions may be proprietary to each vendor, but because they’re built upon a common, open infrastructure they can be mixed and matched, offering the utility competition, innovation and choice. Various EU standard initiatives support this type of approach and indicate there will be many appropriate smart metering and grid standards, not just one. However, the key factor is that interoperability will still exist at the higher levels within the systems enabling a more future-proof solution ready to adopt new technologies. 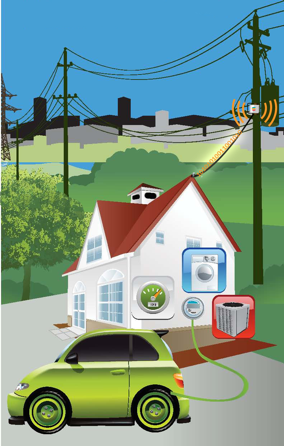 Figure 2 illustrates a scenario of a residential autonomous micro-grid that includes electric vehicles, solar energy generation, smart meters, and smart appliances. Communications within the smart grid devices amongst each other micro-grid occur over power line or RF. The utility communicates with the micro-grid and devices within the micro-grid via an intelligent control node located at the low voltage distribution point. Figure 2. Managed micro-grid featuring smart meters, appliances, electric vehicle chargers and local power (solar) generation. Other future-proof features required in a smart grid system include: advanced functionality in smart meters, such as power-quality measurements, remote-firmware upgrades and an open interface for interoperability with multiple home area network (HAN) technologies; open interfaces at the head-end applications via standard web services; and open interfaces along with distributed intelligence at the neighbourhood transformer. These features will allow utilities to be able to upgrade and add new devices and systems even after the smart grid system is deployed within the home, within the electric grid or at the utility head-end the network. Open Smart Grid Protocol (OSGP) is one example of standard that delivers these types of future-proof features and functionality. In addition, OSGP provides an open architecture and infrastructure supporting both smart metering and smart grid applications. As utilities face increasing pressure to reduce their costs and lower their environmental impact — by reducing emissions of greenhouse gases, for example — they must fundamentally change their attitude toward power generation and resource planning. An advanced metering infrastructure approach will allow utilities to deploy a solution that lets them extend the smart grid and communications infrastructure to intelligent devices inside customers’ homes, make power delivery more efficient, reliable, and safe, and help customers better control their energy use. The ideal smart metering solution will let utilities and their customers implement and access a truly intelligent smart grid — meaning one that benefits both sets of stakeholders — through a variety of technologies.